SeaConditions is also Premium on the Web! Subscribe SeaConditions mobile! 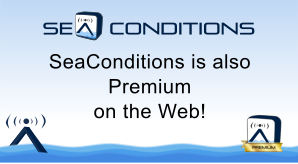 From 1st July you can use Premium services also on the web ( http://www.sea-conditions.com/en/ )! SeaConditions supports the 31° Brindisi Corfù Race (www.brindisi-corfu.it) from 8th to the 10th of June 2016 providing the weather-marine forecast along the race course. A new collaboration between CMCC Ocean-Lab, Links Management and Technology S.p.A and Davidson Laboratory, Steven’s Institute of Technology’s marine research laboratory. TESSA teams will take part to the EMD 2015 Conference and Exhibition. The European Maritime Day Conference will host high-level sessions and stakeholder workshops attracting delegates and experts from across Europe and beyond to discuss the spectrum of opportunities and great challenges that our coasts and seas present, share best practices, and develop new synergies. The related exhibition is an ideal place to showcase strong innovative ideas and products related to the Conference themes. At the conference, TESSA teams will present TESSA project services and products at the workshop n. 10 entitled "Marine data and information powering Blue Growth", to be held on Thursday 28 May 2015 – 11:00 to 12:30 in Room Trianti Hall. At the exhibition, TESSA teams will host the stand n. 32 "Mediterranean monitoring and Situational Sea Awareness services" where our TESSA products and services will be showcased and at disposal to a wide range of scientific, technical and political end-users.